ITSA mystery, and no mistake. 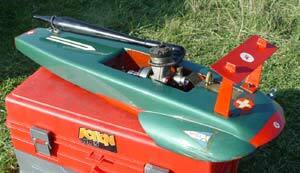 This lovely example of a 60s McCoy 60 powered hydro was campaigned originally by Peter Lambert of the St Albans Club. It passed to Stuart Robinson who ran it in 1996, appropriately winning the Lambert Vintage Trophy. There is a distinct possibility that it may be seen on the water again in the coming season. The Southend registration was the result of the boat being loaned to Ray Gibbs to run in a Championship meeting abroad. 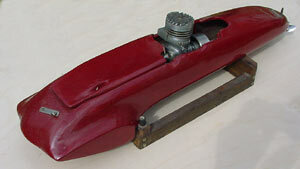 Mike Drinkwater built this amazing Dyna Jet powered hydro many years ago. It was originally contemplated that it would be run free with limited fuel supply, hence the dihedral on the rear planes. The size of this creation can be judged by the genuine 1 foot school ruler. 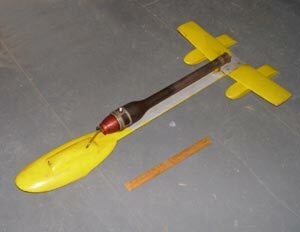 This is certainly the most radical of the pulse jet designs as most of the others were conventional hydroplane hulls with the jet unit added. 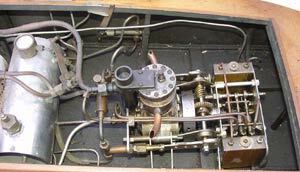 As far as is known the MPBA ban on these power units is still in force. Now where did these come from? Two of the most unusual hydro hulls you are ever likely to see. The grey boat is early American 'Ventnor' style, while the yellow one with its cylindrical hull is a complete mystery. Again it might have trans Atlantic influence as it is likely they came from the same source as they were found together. 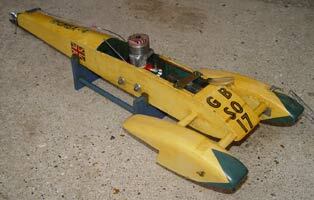 At around 30" long a 10cc sparkie would seem about right for the almost scale looking ventnor. The boats turned up recently on ebay and the vendor had no other information about them, but happily they have gone to two enthusiasts who will be able to re- engine them with something appropriate at some stage. Thanks to Mark Russell and Nigel Mobbs for details and photos. Nov 08. 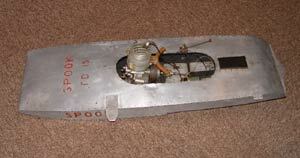 Bob Palmer held the American 'B' Class record in the early 50s with this boat and motor. 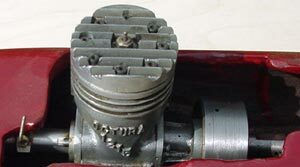 The 15cc motor is from the Octura production castings of the original Watkins/Palmer design. The boat is mainly balsa built on to a ply floor, a design that both these competitors used to great effect. They shared their plans freely with British builders including Norman Hodge with 'Rita' and Ernie Clark with his record breaking Gordon 3, as well as the minute 10cc Patsy. 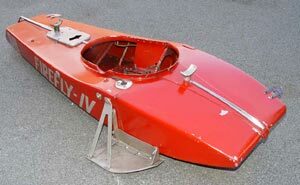 Bill Everitt, used a similar design and building principle for his 30cc 'Melody' that won numerous trophies and individual races during the 1950s. As well as the Palmer boat illustrated, 'Patsy' and 'Melody' have both survived and will be featured at a later date. Amazingly, in 1997 Bob Palmer and friends ran hydros in the States for the first time in many years, and also travelled over to the UK to compete in the International at St Albans.